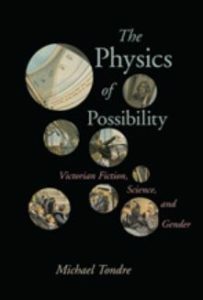 The Physics of Possibility traces the sensational birth of mathematical physics in Victorian literature, science, and statistics. As scientists took up new breakthroughs in quantification, they showed how all sorts of phenomena—the condition of stars, atoms, molecules, and nerves—could be represented as a set of probabilities through time. Michael Tondre demonstrates how these techniques transformed the British novel. Fictions of development by Charles Dickens, George Eliot, and others joined the vogue for alternative possibilities. These novels reflected received pieties of maturation but plotted a wider number of deviations from the norms of reproductive adulthood. By accentuating overlooked elements of form, Tondre reveals the novel’s changing identification with possible worlds through the decades when physics became a science of all things. Going beyond Foucault’s observation that statistics served to invent normal populations, Tondre brings influential modes of historical thinking to the foreground. His readings reveal an acute fascination with alternative temporalities throughout the period, as novelists depicted the categories of object, action, and setting in new probabilistic forms. Privileging fiction’s agency in reimagining historical realities, never simply sanctioning them, Tondre revises our understanding of the novel and its ties to the ascendant Victorian sciences. Michael Tondre is Assistant Professor at Stony Brook University (SUNY). His essays have appeared in PMLA, ELH, Nineteenth-Century Literature, and Victorian Literature and Culture.